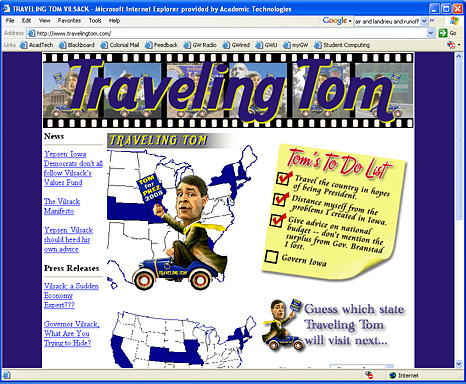 The Republican Party of Iowa launched the "Traveling Tom" website on October 26, 2005. 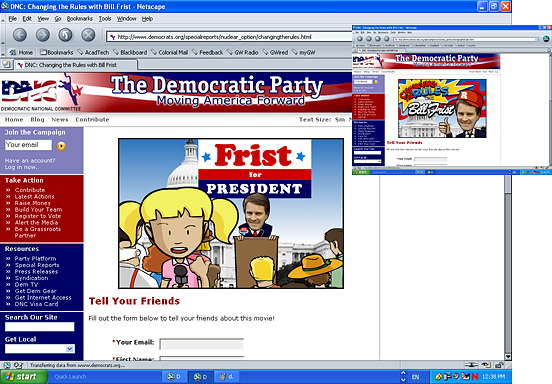 According to the press release, the site highlights "the constant travels and changing values of Iowa Governor Tom Vilsack as he pursues a national profile." Iowa GOP executive director Cullen Shaheen stated in the release, "We have real problems to address right here in this state. Candidate Tom should spend his remaining tenure here in Iowa working with legislators to address those problems, that's what Iowa taxpayers pay him to do." 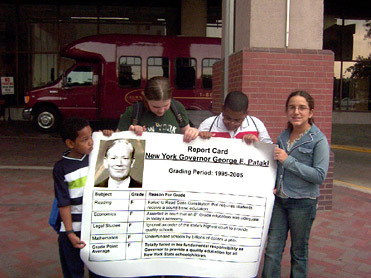 The Alliance for Quality Education, a New York coalition, organized a trip of several parents and students to Cedar Rapids, Iowa on September 13, 2005 "to deliver a failing report card to New York Governor George Pataki because he has failed children by under funding public schools." [press release] Pataki spoke to the Cedar Rapids Chamber of Commerce.